I love Valentine’s Day themed crafts and activities for both kids and adults. There’s something about them that just make me happy. 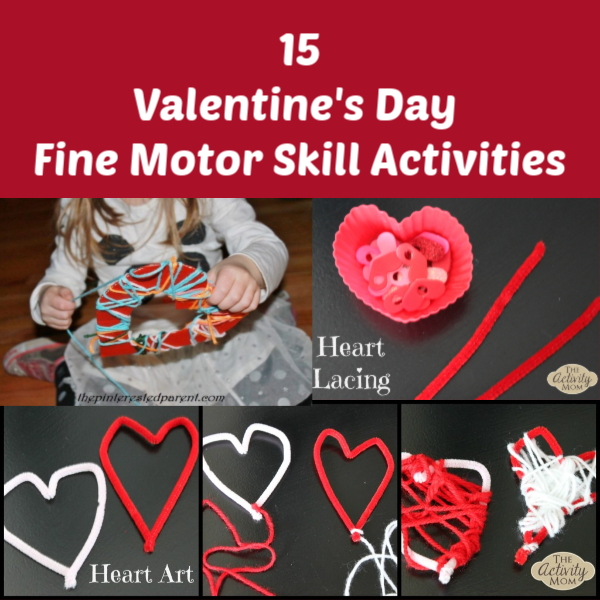 Why not sprinkle in a little learning with your Valentine’s day themed fun by adding a fine motor skills challenge to the activity? 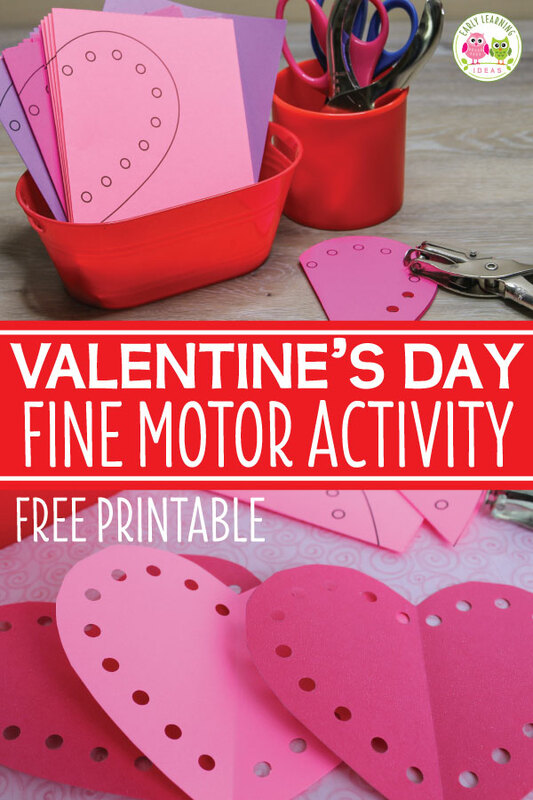 Give these Valentine’s Day Fine Motor Activities a try! 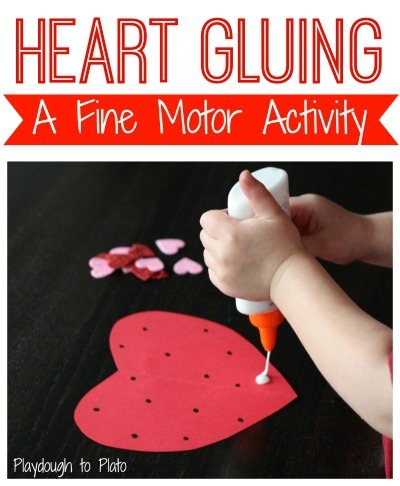 I love this Heart Art idea for a fine motor skill challenge. All you need is a pipe cleaner shaped into a heart with a string tied on the end. Then challenge your child to wrap the string around the heart any way they want. Wrap a bunch of hearts and make a mobile by hanging them all from a stick. 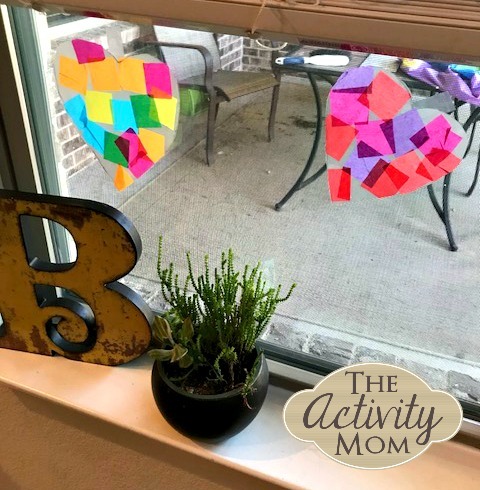 Your child will love this Valentine’s Day Suncatcher Craft and it gives the chance to work those fine motor skills by pinching the paper and moving the wrist to place it on the sticky paper. 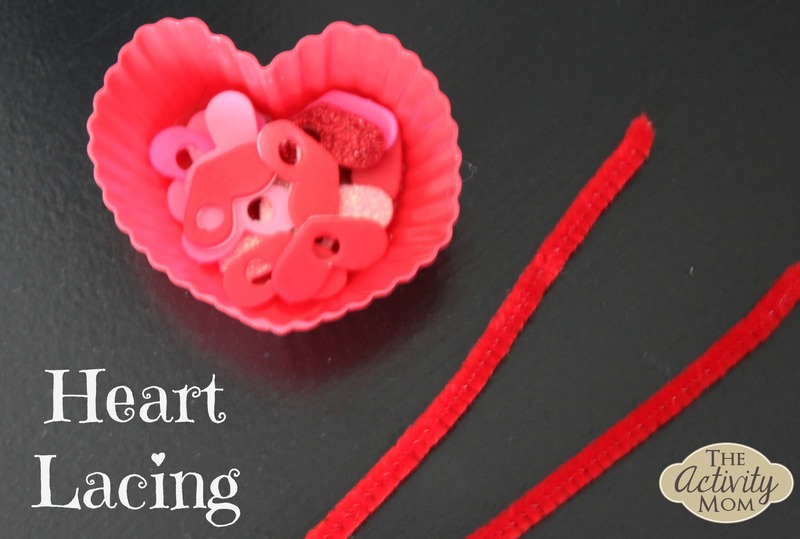 Heart Lacing is super simple to set up and draws children of all ages to give it a try. Punch holes in foam heart stickers and put out pipe cleaners (or string for older children) and let them lace. Whether they are making a bracelet or just lacing onto the pipe cleaner for the experience, children are drawn to this activity and it is great for fine motor skill development. 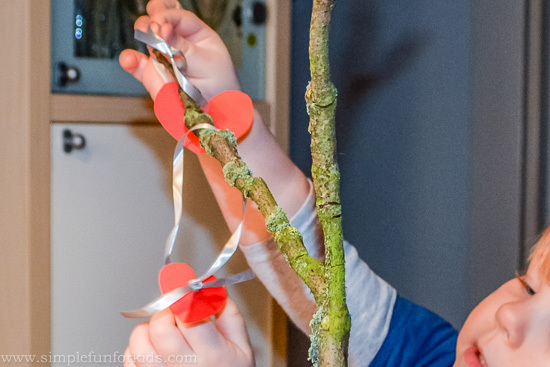 This Valentine’s Day Tree from Simple Fun for Kids is awesome for fine motor development. From cutting the hearts and lacing the string to hanging them and rehanging them on the branches is so fun! Early Learning Ideas features this heart themed fine motor activity that can be adapted to all ages and there is also a free printable to save you time. 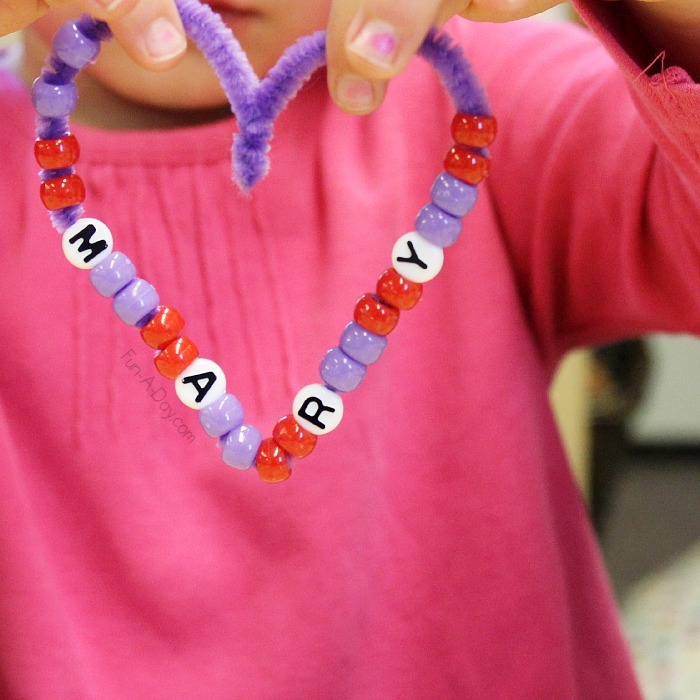 These beaded name hearts from Fun a Day are adorable and add a personal touch to a fine motor skills valentine craft. 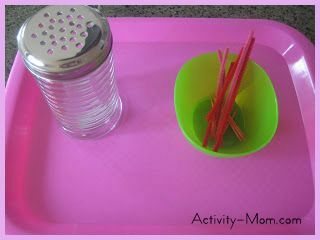 Toddlers and preschoolers love this simple activity using a salt shaker and pipe cleaners or toothpicks. Find more simple activities just like this one at Valentine’s Day Activities for Toddlers. 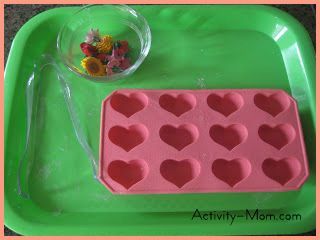 Any ice cube tray and pom poms will work for this fine motor skill activity, but this adorable heart tray makes using the tongs to transfer the pom poms a fun valentine treat. You can find more simple activities just like this one at Valentine’s Day Activities for Toddlers. Add heart shaped beads add a fun twist to this classic lacing activity. 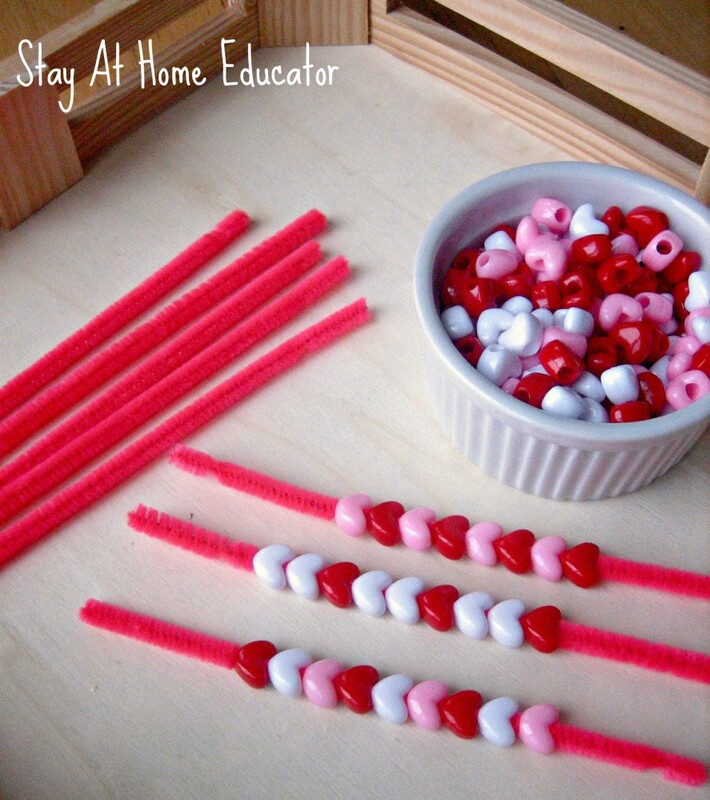 You can also turn this into a counting or patterning challenge like she did at Stay At Home Educator. 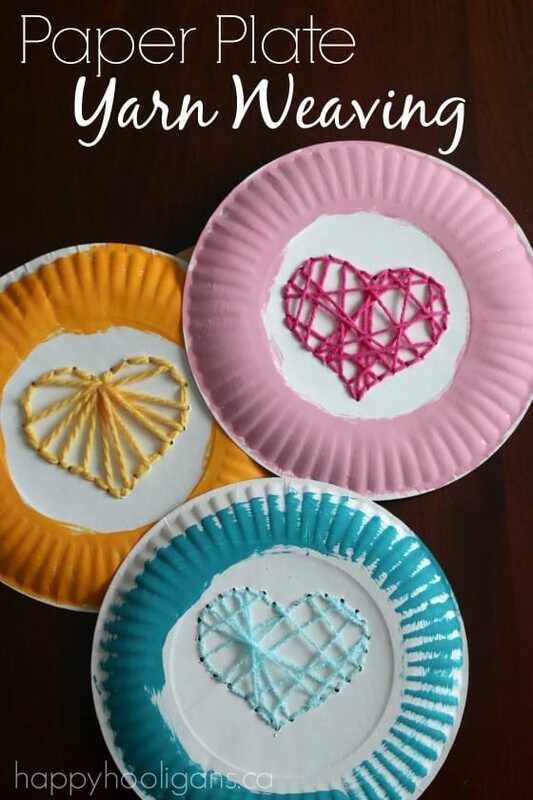 This paper plate heart stitching craft from Happy Hooligans is easy to prepare and is inviting for all ages to give it a try (including me). I love how the color of yarn matches the border and it is also so cool to see the different design options that can be made. 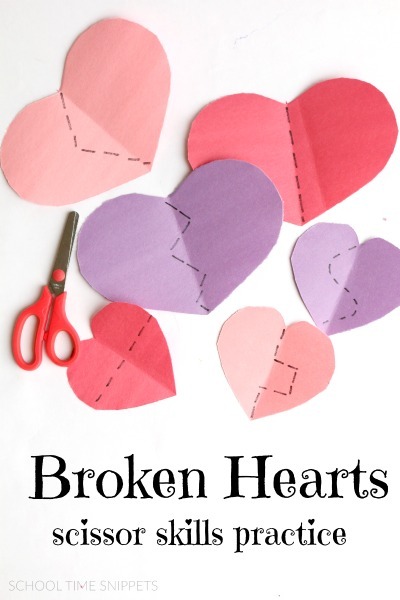 Get out those scissors for this Broken Hearts activity from School Time Snippets. After they are all cut out, mix them up and turn them into a puzzle. 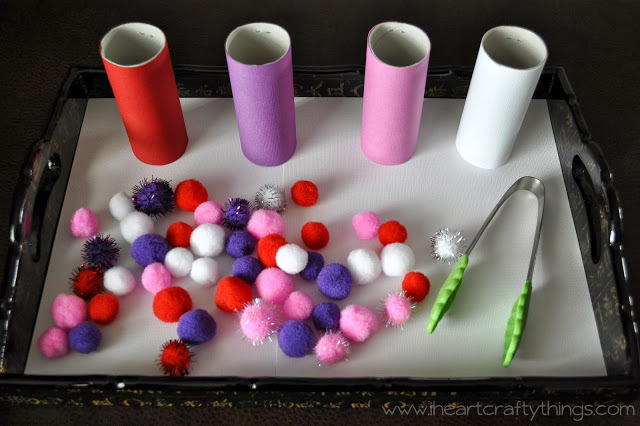 This tray of sorting pom poms by color, using tongs is a great fine motor challenge from I Heart Crafty Things. Buggy and Buddy has a great fine motor activity using heart shaped noodles, straws, and play dough. You can also use this for sorting, counting, patterning, and graphing. 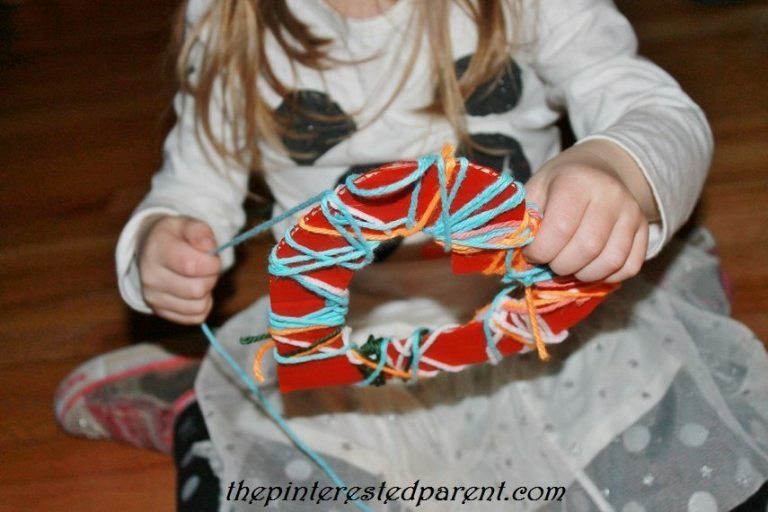 The Pinterested Parent features this yarn wrapped heart craft which is not only adorable, but also a great fine motor skill activity. Squeezing that glue bottle strengthens hand and finger muscles which is necessary for fine motor skills development. Playdough to Plato used the glue bottle in this heart craft.